I have much to learn. That's generally the conclusion of any PhD student, and while I don't have the stomach for such a qualification, I'm beginning to feel that way about the world of cake decorating. Thankfully, learning is rarely achieved alone, and I'm grateful to have lovely friends and inspirers to teach and encourage me along the way! 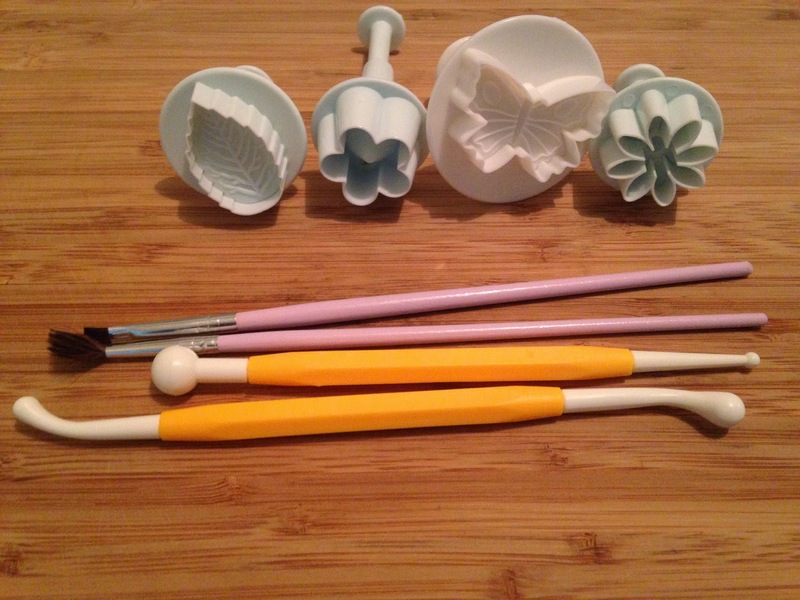 This post is one of a series (of two, at least...) where I will share my recent 'I can't believe it's so easy that I can do it myself' baking discoveries. This first one details my introduction to fondant art. Let me introduce D - she's a great gal with a lot more experience than me (zero experience prior to this post) with fondant decorations, in particular flowers. So while all I generally want to do is smear buttercream everywhere, I realised her skills would be super-handy to add appeal to any baked item! 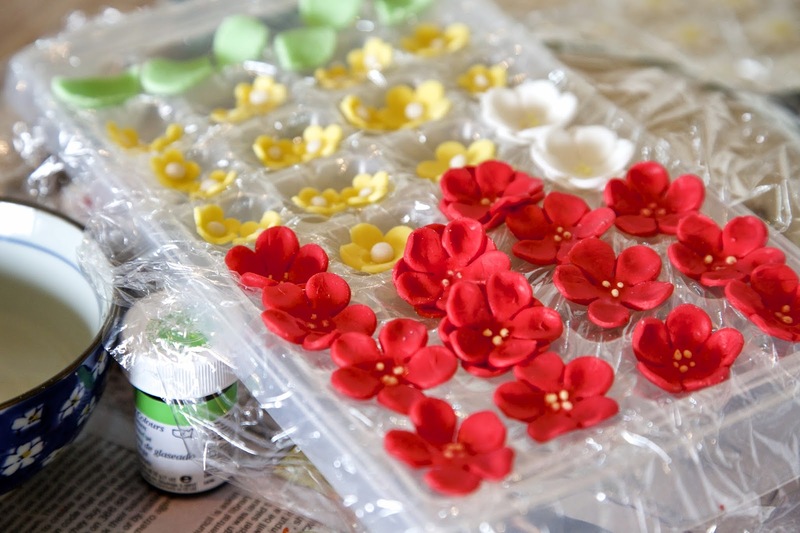 We picked bold red, pastel yellow and green for our tiny s-petal-acular creations (har har!). D showed me how to add a few drops of gel colour to a lump of plain icing and knead it until the colour evened out. We then rolled our icing into the thinnest sheets possible, pressed in the dainty cutters, and the little shapes would fall out onto our palms. 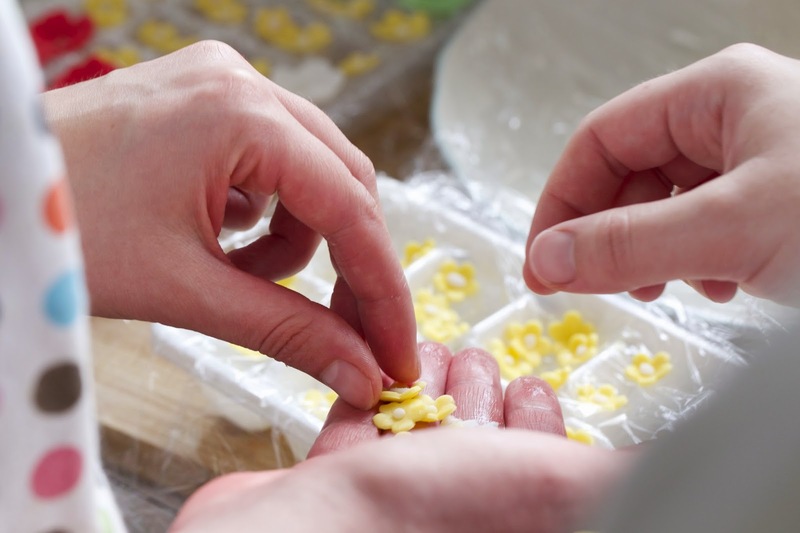 Shaping and moulding flowers happened in the palms of our hands with some clever tools, then we plopped the little guys onto a bed of clingwrap spread over specially designed plastic trays (or ice cube trays if you've got them) to dry them out in semi-up-turned positions. 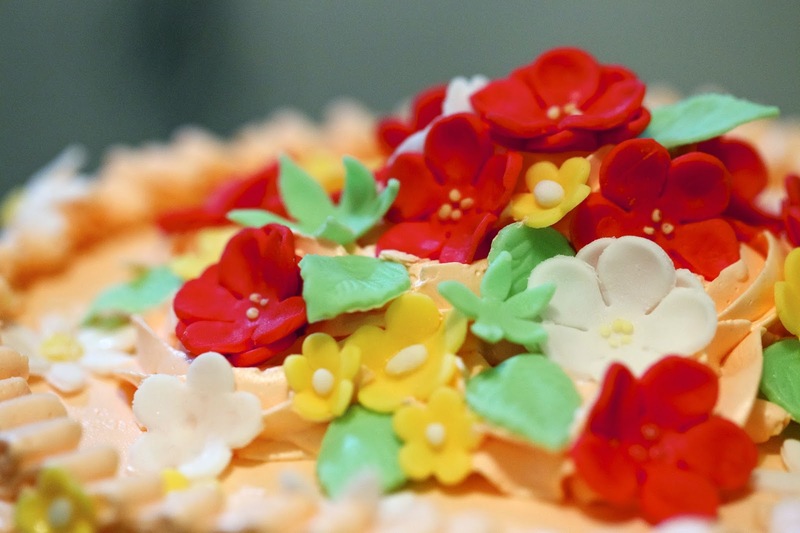 I recently learned that melted chocolate is an excellent adhesive to use for attaching fondant flowers to cakes, although you might not need one if you're sticking them to freshly-piped buttercream. Here's a rough ingredients list and a more detailed description for replicating the fondant flora that we made. For each lump of icing that you would like in a different colour: add a few drops of gel food colouring to the lump of royal icing and knead together until all the icing is a uniform colour (you may want to add more gel colouring for a bolder colour; and yes, it will get all over your hands...!). Sprinkle icing sugar onto your plastic chopping board. 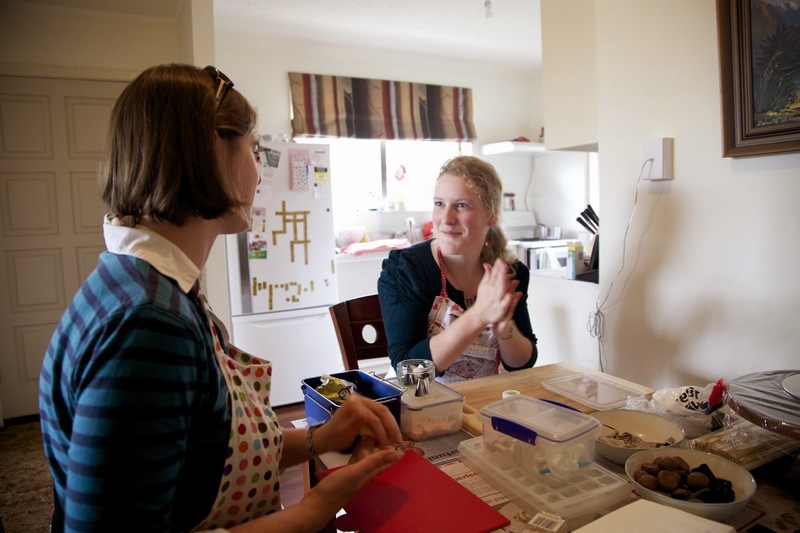 Using your smooth rolling pin, roll out the icing on the board until it is approximately 2mm thick. 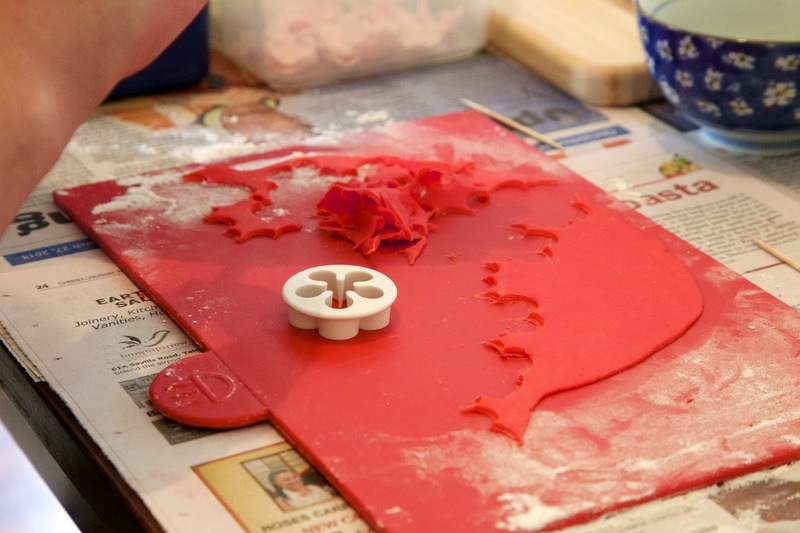 Position a fondant cutter over the icing and press it into the board. If you're using a leaf (or other decorative cutter) with an indentation pattern, press to indent. 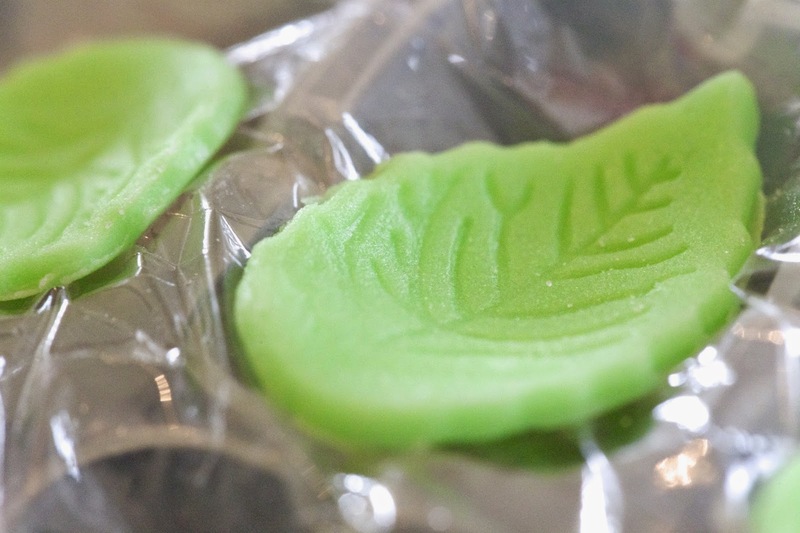 Drop the fondant leaf onto the cling wrap-covered ice cube tray, so that it sits above the centre of one cube hollow - it should curl slightly upwards from its centre. 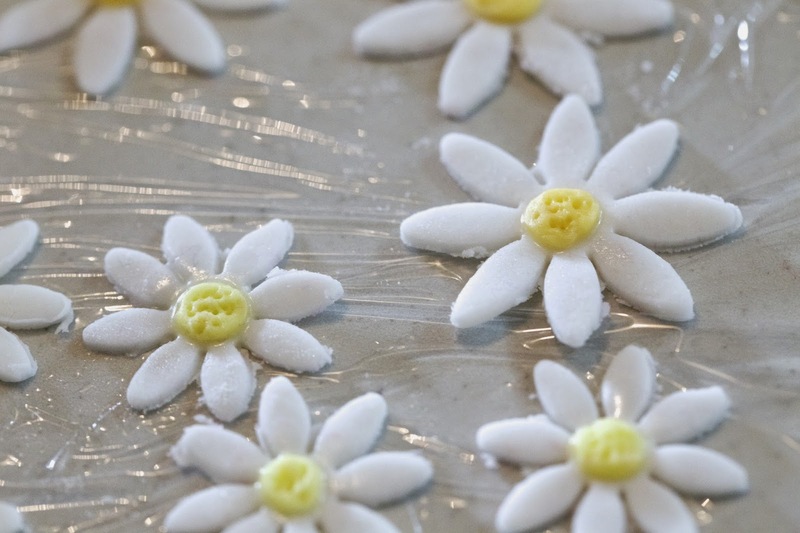 If you're using a flower cutter, sprinkle icing sugar onto your palm before sliding the cutter off the board (hopefully with the fondant shape inside it!) and dropping the fondant shape onto your palm. 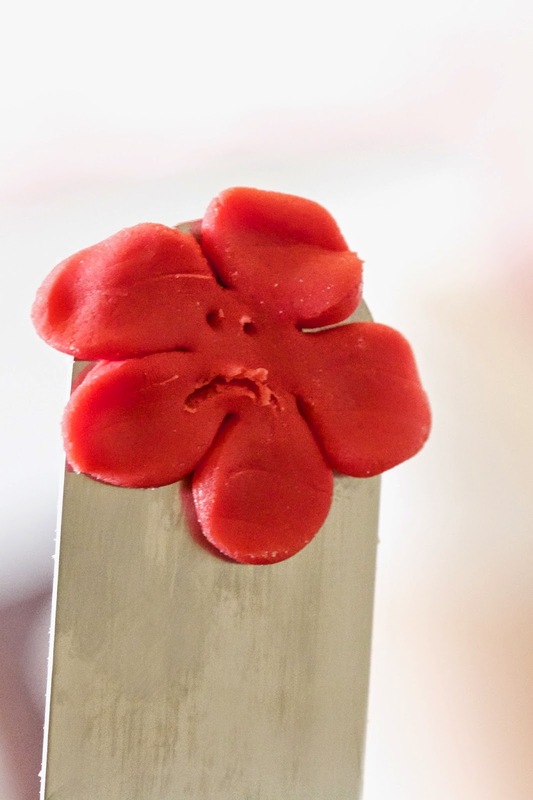 Use the rounded end of a fondant shaping tool to smooth the petals, moving from the centre of each petal to the edge. This will take some practice until you know what sort of shape you'd like to create. Tools of the trade: shaping tools, fine-tipped paintbrushes and a selection of cutters. 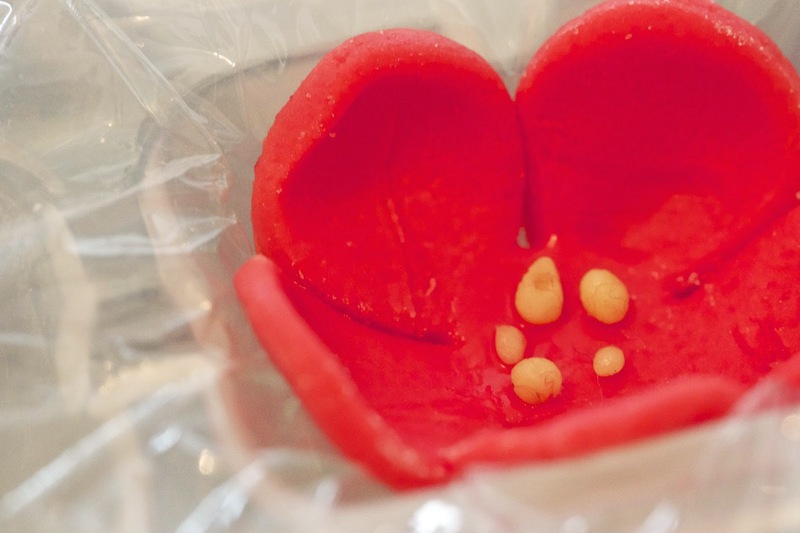 Drop the shaped flower onto the centre of one cube hollow of the cling wrap-covered ice cube - try to ensure that the petals curl upwards. Using a paintbrush, apply a tiny amount (less than a drop) of water to the centre of the flower. Roll some of another colour of icing into tiny balls (each approximately half the size of a pin head) and drop them into the centre of the flower. Using a toothpick, you can prick the centre of a solid-coloured centre to add texture. 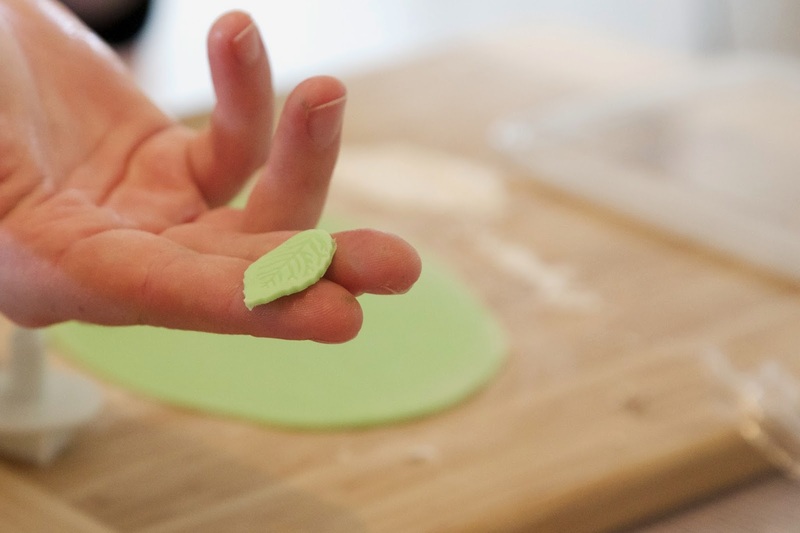 The fondant shapes will dry naturally, uncovered, however they will dry faster if left in front of a fan or in an area with good ventilation. The less food colouring and water added, the faster they will dry. When dry and hardened, store in an airtight container and keep in a cool place.